On Thursday 12 December there was a strong showing from Mackay locals at a protest we organised at the North Queensland Bulk Ports office in Wellington Street, Mackay against the approval of the dredging and terminal construction at Abbot Point, near Bowen. In an event described by the Daily Mercury as 'dramatic' we threw dredge spoil over some of local marine creatures: dugongs, reef fish and sea turtles. All of these animals will have their habitat affected by the proposed 3 million cubic metre dredging project. Bimblebox Nature Refuge is a peaceful 8000 hectare sanctuary in central-west Queensland. Bimblebox is a wonderful example of remnant semi-arid woodlands with an understorey largely made up of native shrubs and grasses, and is home to a rich diversity of birds, reptiles and other animals. In May 2011 a flock of endangered Black Throated Finch (Poephila cincta cincta) was sighted on Bimblebox, which has been confirmed by Birds Australia. The peaceful refuge that is Bimblebox is threatened by a plan by mining billionaire Clive Palmer’s Waratah Coal to build the Galilee Coal Project (formerly known as ‘China First’). The Environmental Impact Statement outlines a proposal to extract 40 mega-tonnes of coal per year. The coal would be transported on a yet-to-be-built 468km rail line up to Abbot Point and shipped through the Great Barrier Reef on its way to China where it will be burnt for energy generation. The ambitious and polluting plan has not yet received formal government approval, which means there is a still a chance to stop it. It is outrageous and absurd that in the 21st Century, with all that we know about Australia’s biodiversity crisis and the threat of climate change, that a protected area rich in biodiversity and with carbon stores intact could be sacrificed for the sake of producing more climate changing coal. A rare and unique bird, the Eungella Honeyeater, urgently needs its habitat protected from mining and logging if it is to survive. The Eungella Honeyeater (scientific name Lichenostomus hindwoodi) is one of the last new species of birds discovered in Australia, identified only in the early 1980s as being a different species to the more common Bridled Honeyeater. The only place the Eungella Honeyeater can be found is in a small area of plateau rainforest in the Clarke R ange, about 65 km west of Mackay. The Eungella Honeyeater cannot be found anywhere else in Australia and is currently listed as being “near-threatened”. ‘Eungella’ is an aboriginal word meaning ‘mountains of the mist’ – which perfectly describes its habitat. Act now - email the Minister to protect the habitat of the Eungella Honeyeater. How would you feel if a gigantic coal terminal, spraying coal dust and digging up the seabed, was about to be built just a few miles south of your home? That’s the situation for the people of Mackay. Just 20 or so kilometres south of this central Queensland coastal town lies an enormous coal port, its piers stretching 2 km out to sea with great mounds of coal lying in the open, waiting for the prevailing winds to blow them over the population of Mackay. As Queensland prepares to build the largest coal ports in the world on the edge of the Great Barrier Reef Marine Park and World Heritage Area, few protections are in place to prevent the destruction of fish, coral and iconic marine mammals. Green and Flatback turtles nest along the beautiful Abbot Point Beach just east of the sand dunes containing the Juru burial grounds which themselves would adjoin the enormous coal stockpiles. As the coal dust blows off the stockpiles and rain leaches toxic chemicals into the near shore marine waters, the turtles will ingest this pollution via consumption of the local sea grasses. If coal miners and coal port owners get their way, 16 million cubic metres (~4535 million tonnes) of the seabed at Abbot Point in Queensland will be dredged and dumped into the World Heritage listed Great Barrier Reef Marine Park. The proposed dredging is to allow the expansion of the Abbot Point Coal Port near Bowen in Queensland. The mud to be dredged is enough to fill the Melbourne Cricket Ground (MCG) 30 times over. The proposed massive increase in mining and coal ports on the Queensland coast adjacent to the World Heritage protected Great Barrier Reef is predicted to see an increase of 5 times in the number of shipping transits. This increases by 5 times the risk of oil spills, reef damage, groundings and boat strikes on marine mammals like dolphins, whales and dugongs. Dugongs were once so plentiful in Queensland that observers commented that it would take hours for the 100 metre wide herds to pass by, the water thick with their wallowing movements. 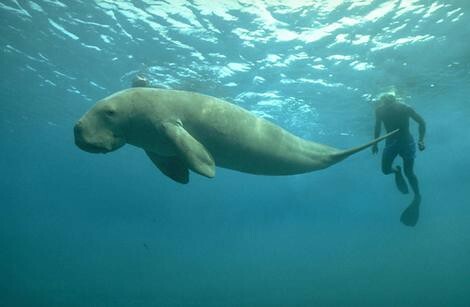 Today, dugongs are officially recognised as being vulnerable to extinction. Will the day come when there will no longer be dugongs in the clear shallow waters off the coast of Queensland, and the only place you’ll be able to see one is in an aquarium? One of the most beautiful and largest coastal Wetlands in Queensland is in real danger of permanent damage as a result of the expansion of the Abbot Point Coal Ports, associated rail links and industrial development in the adjacent Abbot Point State Development Area.